We’re asked to film a fantastic variety of corporate videos and promotional films for clients across the UK. This breadth of products and services spans a huge range of different solutions. 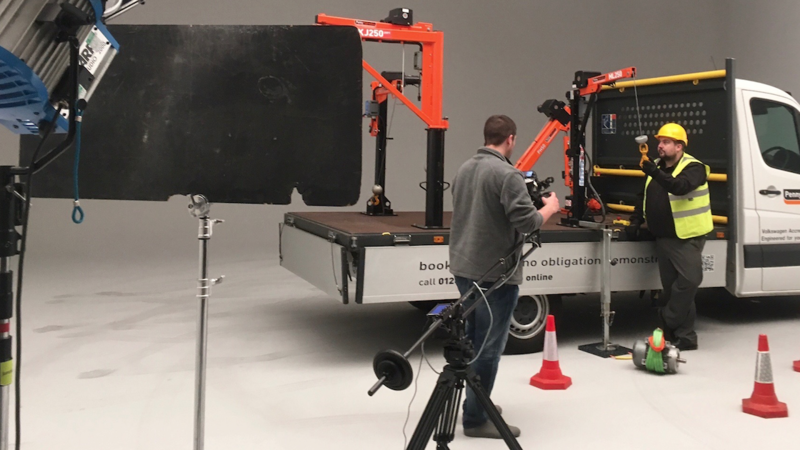 One of our latest promotional films showcased a range of vehicle equipped cranes for one of the largest specialist crane companies in the UK. The filming took place in Oxfordshire and was a great demonstration of how a clean and cavernous studio environment can provide a fantastic backdrop with the right look and feel for a range of different product videos. Whatever product we’re tasked with filming for our clients there is always a detailed two-way thought process involved to decide where that product will look at it’s best and how the shots would be captured in this environment. At this stage we work with corporate video clients to ensure that we can re-create their product in it’s natural environment – for example by interchanging backgrounds to represent their natural service sectors, whilst showing the product to look as spectacular as possible and in ways that are unique to the market-place. Equipment for any of our shoots is selected to compliment the products filmed. In this instance it was important to ensure smooth and graceful movement allowing for special effects to be added retrospectively in post-production to further enhance the footage. Whatever we are tasked with filming, we decide what will make a product stand out with the consideration over making highest possible impact – what does an innovative solution look like – and how far can we push the boundaries to ensure the client receives footage that is capable of winning them enquiries and maximising their return-on-investment. On shoot it’s all hands to the deck in order to make each product look as stunning as possible – whether it’s a £100,000 sports car or a £20 retail product, we ensure the product look is perfect including extensive lighting and equipment – no detail is overlooked, even cleaning the products. A bit of elbow grease is a given on our shoots. From a detailed and pre-agreed shot list we are able to film precisely the agreed elements that allow a synergy across the product range. By having pre-production meetings with clients these elements and far more are discussed to ensure the filming perfectly reflects any storyboard which gives a consistent approach for a product range. Across the project we are on hand to make suggestions to clients – covering innovative visual solutions, ways of showcasing products with new backgrounds and special effects to add the wow factor and a deep underlying consideration to what we want the viewer of these films to feel and do after watching it. Their reaction is one of the most considered aspects of our filming – without putting ourselves in their shoes, we can’t ever hope to understand the action we’d like them to take. If you want to showcase a product and you’re looking for a company that goes the extra mile to make your footage as unique as it deserves to be, then talk to Energise Media. Whatever product you’re looking to film, we’ll create a stunning plan for you to make it happen. Something that is unique to your market place and something that delivers a compelling return on investment, whilst establishing you as a market leader.